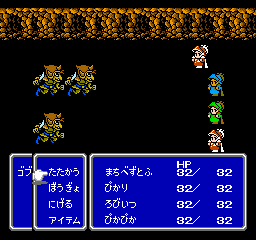 OverviewThe third Final Fantasy released on the Famicom. This version of the game was never released internationally. Well, It's the one FF that i haven't played becuse it was only released in Japan. 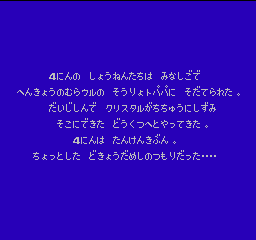 Sadly, this is in japanese xD so it's a little hard to read, hoping I'd find an english version, but sadly no. The game itself...is...long. Lots of grinding and without a doubt one of the most grind demanding FF's out there. Regardless, It's FF and I love it, now if only it was english. Now you can add videos, screenshots, or other images (cover scans, disc scans, etc.) 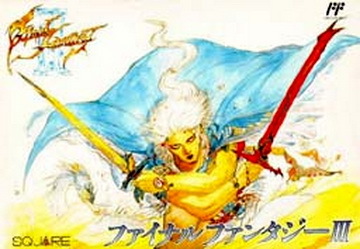 for Final Fantasy III (Japan) to Emuparadise. Do it now!